KINGSTON, Jamaica — Here is the schedule and live streaming information for Day 4 at Champs 2018 at the National Stadium in Kingston, on Friday night. Dominating the list of events on the schedule for the fourth day is the final of the boys and girls 100m for all classes and we are expecting a few records to be threatened, if not improved. 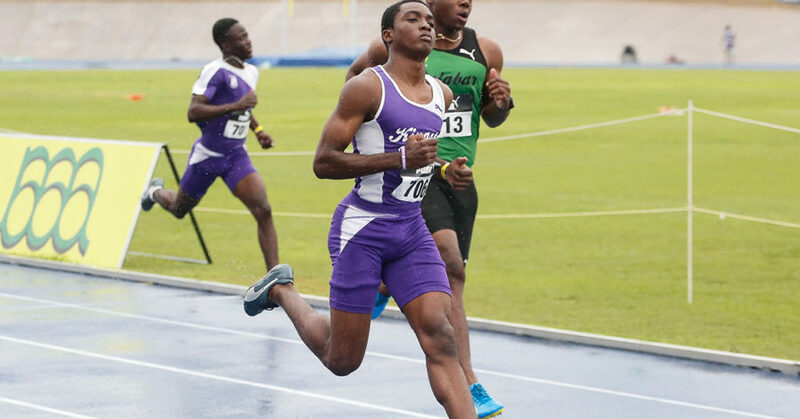 Leading the way on the “must see” event list is the Class One boys 100m, which will feature defending champion Michael Stephens of Calabar, as well as his teammate Tyreke Wilson, early favourite Jhevaughn Matherson of Kingston College and also Jamaica College’s Michali Everett. Wilson won his semi-finals ahead of Matherson in 10.39 seconds, but the latter, who trains under the guidance of Glen Mills at the Racers Track Club, showed that he has a lot more in the tank for the final later tonight. Everett also looked good when winning his heat in 10.44 seconds and he will be hoping to surprise the pre- Champs favourites, while his teammate Ryiem Robertson, running in a -1.1 headwind, took the third semis in 10.45. Stephens was second to Robertson in 10.46 and he will need to work on his start and the first part of his race if he wants to defend his title. Meanwhile, the standout performance in the girls’ 100m came from Kevona Davis of Edwin Allen who sizzled to a new record of 11.35 seconds to win her semi-finals and advance to the final as the clear gold medal pick. Also on the list of events to look out for on Day 4 at Champs 2018 Friday night are the 400m hurdles, especially the Class One boys event, which could see, for the first time, more than one runner running below 50-seconds. Some 19 finals are set to be contested at Champs 2018 on Friday’s Day 4.